Snippets of Jack: "But Pirate Is In Your Blood, Boy"
"But Pirate Is In Your Blood, Boy"
I have just concluded that there are a lot of similarities between Jack, Elizabeth, Will, and Angelica, besides the obvious being that they are all pirates. Firstly, all of them no longer have living mothers. Well, we aren'ts rue about Angelica but it seems to be the case. Something happened to Jack's mother that has to do with his father. Apparently he wears her head around his neck. I don't even want to know. Elizabeth's died somewhere out at sea. Will's mother died when he was youngh, sending him off to find his father. That brings me to my second point: all of them have fathers that appear in the movies. We've got Will's dad who comes in in the second movie. He's part of the crew of the Flying Dutchman. Jack's father is in the third and fourth movie. He lives in Shipwreck City as keeper of the Code. Jack more or less grew up with him there. He somehow arrives in London just about the same time Jack does a few years later. Pretty lucky. But then again, I wonder if he actually was there because he seemed to disappear all too quickly. Then we've got Angelica's father who just so happens to be one of the most infamous pirates of all time: Blackbeard. He's the captain of the Queen Anne's Revenge. Now Elizabeth's father is the odd one out, because he's the only father who isn't a pirate. In fact, he's almost the polar opposite of one: he's a governor! For the longest time, he despises pirates, then of course his daughter becomes one and things sort of change. She's the only one of them who doesn't come from pirate lineage, yet she ends up being the king of them! I'd also like to point out, that Will, Jack, Elizabeth, and Angelica are all rather good looking, at least compared to their parents. Like, where did their genes come from. For example, I think Jack is probably the most attractive person on the planet, but I definately could not say the same thing for his father. I'm just not really feeling the dreds on him. Jack is the only one of them who doesn't seem to care all that much about his father. Perhaps if you've read the Jack Sparrow series by Robb Kidd and published by Disney, you would know the back story of this. But I haven't though I have read The Price of Freedom which explains that Jack did most of raising himself on his own. And he's pretty bitter towards Teague. I would also like to point out that Blackbeard's real name is Edward Teach, and the Keeper of the Code's name is Edward Teague. Pretty similar. I am seeing just way too many of these similarities between the family lines. As for the other characters, I don't think we get much about their families. In the Price of Freedom we read about Beckett's early lie though. His family was really mean to him, but I mean, I can see why. That dude's a pain in the boat. But there isn't much to say about Gibbs' parents or Barbossa's. Of course, Barbossa is older than the four of them, so it would be doubtful that his father would still be alive, especially during the eighteenth century. 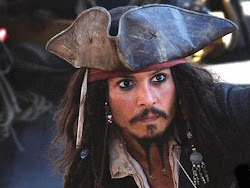 But Barbossa is just such a pirate, it has to be in his blood. My guess is that he grew up a pirate because one of his parents was a pirate also. Pintel and Ragetti are related though. Pintel is Ragetti's uncle, so I guess piracy runs in their family. Do you think that Will's son will become a pirate? Oh man, I can just see that becoming a movie!